The PC version of the Destiny 2 beta landed this week, and it’s remarkably slick and pretty. For a certain subset of gamers, a difficult decision looms: PC or console? I already knew that Destiny would be good on PC. I played the PC version months ago and said as much. With this week’s beta, thousands more PC owning Destiny fans will get to experience firsthand the vivid weirdness of playing Destiny at 100+fps with a mouse and keyboard. (Footage of the PC version has been floating around for a while now; you can watch some here). Despite my prior experience with the PC version, I still wasn’t quite sure how it’d feel to play it on my home PC, which I finally did yesterday morning. After five minutes with the beta, it became clear that barring some exceptional unforeseen development, PC will be the best looking, best-playing version of Destiny. The game looks great on PS4 and all, but it’s in a whole other league on PC. It also plays more smoothly and feels much more responsive. I’ve always liked (and still like) the weighty feel of Destiny on console, where it runs at a sturdy 30fps. I’m sure that part of my reaction is simply due to the novelty of how different it looks and feels on PC, but in this case, different also means better. There’s so much more visual information than I’m used to, because each second is filled with dozens more frames and each frame is packed with thousands more pixels. I can better appreciate Destiny’s art and am routinely catching so many tiny details I would’ve otherwise missed. Destiny has always been overflowing with colorful explosions, but the clarity of those explosions on PC makes the console versions feel blurry by comparison. My Titan’s shield radiates with tiny glowing particles; Cabal Psions explode with beautiful purple bursts when I shoot them just so. I can pick out my enemies’ facial expressions as I fight them, and more easily read their body language as they move. You can count Brann’s teeth in real time. When I played the PC version back at the reveal event in May, I opted to stick with mouse and keyboard controls the whole time. This time around, I decided to start on controller, since I’ve spent years achieving a mind-meld with Bungie’s impeccable Destiny control scheme. It was a good call, at least for my understanding of the beta. My May impressions were dominated by how wild it felt to play with the precision of a mouse, and I’m sure that when I play PvP on PC, I’ll stick with that control scheme. (One of the benefits of the PC version is that it’s possible to instantly switch between the two.) But with a controller, it was actually easier to directly compare the two versions. The PC beta also appears to be exceptionally polished and well-optimized. The game regularly breaks 100fps for me with everything pushed up about as high as it’ll go, and I have yet to encounter a noticeable frame-rate dip. Granted that’s in the beta, which lacks for large outdoor environments, and also granted, I’m using a pretty hefty rig with an i7-7700k processor and a GTX 1080 GPU. But I’ve seen plenty of other players reporting solid performance on a variety of setups, and the port of the beta just seems to be slick and well put-together overall. There’s no stutter, the mouse works great with no weird smoothing or lag, and the menus are easy to use with a controller or a mouse. 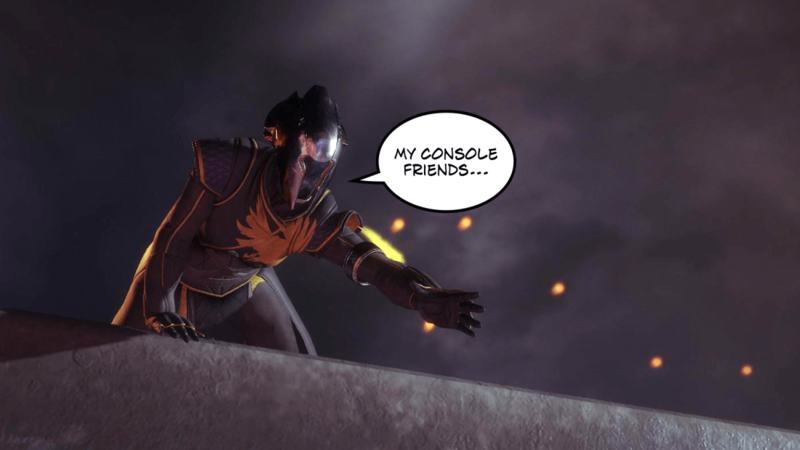 Bungie and Vicarious Visions, the studio helping with the PC port, have so far avoided the most common problems cross-platform developers run into on PC. The question, then: If you’ve spent the last three years playing the game on PS4 or Xbox One, what do you do? The console versions launch next week on September 6, while the PC version doesn’t hit until October 24. That makes the decision easier in some respects—if you’re a Destiny true believer, you’re likely planning to play the game on console first. But what happens when October rolls around? Stick with the console version, since you’ll have made so much progress that it’ll be a drag to start all over on a new platform. Don’t buy it on console at all, and just wait six weeks. Try to play on both console and PC, and if one gradually becomes your preferred platform, let that become your default way of playing. The third option is arguably the best one, but it requires buying two copies of a game and, if you’re serious about sticking with both, all of the pricey expansion packs. That’s a lot of money, even if you wait until you’ve played some of the console version and determined that it’s good enough to double-dip. The “why not both?” approach also requires investing time in two different versions of the game, and Destiny already requires a lot of time. If you finally get that precious exotic armor to drop on PC, are you really gonna want go back to Xbox One, where you no longer have it? The second option is a tough call for superfans, since it means waiting almost two months while console players crack secrets, beat the raid, and excavate the game’s loot and surprises. On the more positive side, waiting means that Bungie will have six weeks to fix problems that may come to light during the console launch. Look at the PC beta: They’ve made a bunch of small tweaks to ammo and charge-rates since the console beta, and I already noticed they fixed that weird turbine section and made it more playable and fun. Complicating the decision is the fact that Destiny lives and dies on its community, and if you move to PC from Xbox or PS4, you risk leaving your community behind. In fact, that’ll probably wind up being the deciding factor for a lot of people, including me. A lot of my friends play on PS4. I know some are planning to play on PC as well, but not all. Is that number big enough? Can we talk the remaining players into switching? Would I still love playing Destinyas much if I couldn’t play with some of my oldest Destiny friends? For the majority of video games, true cross-platform play remains a pipe dream. (Oh, for a world where I can play on PC with my friends on PS4!) I’ve never had to deal with a question like this for a series I play as much as Destiny. The closest comparisons are probably Diablo 3, which I played on PC but only came to love when it came out on PS4, and Overwatch, which I abandoned on console more or less the moment I bought it on PC. I’m not sure what I’m going to do, and I’m guessing I’m not alone. Readers, I put it to you: Assuming you’re planning on playing Destiny 2 and have both a console and a gaming PC, what’s your plan?